The first mention of an alehouse in Otterton was in 1673, although it is not known if this was the origin of the Kings Arms. However, by 1711 the Kings Arms predecessor, The New Inn was in existence : Robert Kelley. Licensee. (License Victuallers Returns)During the 18th.century the New Inn played an important part in village affairs – supplying liquor for all Parish occasions, as the Parish Accounts testify :- 1754 “To expence at Mr. Batts 7/-“; 1756 “To Mr.Batt for what the Ringers had on Kings Coronation last year 2/6d”; 1757 “ To Mr.Batt for Parish Meeting 13/-“. William and Mary Batt were licensees 1753 to 1775. On Williams death in 1765, Mary continued at the New Inn to 1775 when she moved to the Golden Lion and Thomas Woolcott took over. He was the tenant, the lease being held by Aaron Barrett until 1790. The Golden Lion was a 15th.century house on The Green. The 1790 Survey shows Michael Dare & Thomas Potter holding the lease No.62 “Dwelling house, garden, court, stables called The New Inn. Rent £10pa. & Colyford part Burgins 2 acres £2pa.” Potter may have been the licensee.In 1800 the New Inn had changed its name to Kings Arms ; Matthew Palmer, licensee, and early in the 19th.century until the 1840’s it was the main Post Office in the Lower Otter Valley. 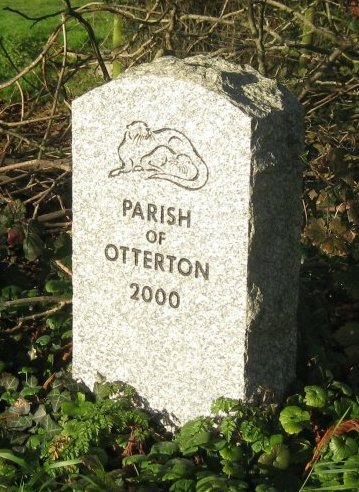 All mail was brought here, hand stamped “Otterton Penny Post” and dispatched to Exeter. This included Budleigh Salterton and East Budleigh mail. Matthew Palmer was succeeded by his son Robert probably in 1828. By 1841 Robert is 60. By 1847 Roberts son John is licensee and is inviting people to a Ball at the inn (Advertising Bill). John had been apprenticed as a cabinet maker. He is named as licensee in the 1851 Census with his wife, son and daughter age 3 and 2 respectively.His wife died in July of that year, probably unexpectedly. In 1853 a petition to support posting a policeman in the village was raised as a disturbance had taken place at the Kings Arms and an outside constable had been called in. He appealed for help from some of those present but they assaulted him. Following their conviction the constable’s house was set on fire. The petition had stated “a large proportion of the inhabitants bear a bad character, many of them appearing to live well without any visible means”; they plunder by night and cause malicious injury to property, such as breaking gates to pieces, cutting down and carrying off railings, lopping trees for firewood and robbing gardens”. Annually all the fish in the salmon hatch at the Mill were stolen. A constable was appointed in June 1853 and a police cottage and clothing provided from £61.1/- raised by Otterton Vestry. Furthermore a clink was rented from the Estate by the Inspector of Police at 10/- per annum. This was situated in St.Thomas Hill (Maunders Hill). By 1857 Edwin Snow is licensee. He was probably connected with Snows Tiverton Brewery. He died suddenly in 1858 aged 35 and his wife Betsey carried on at the inn, remarrying Thomas Harding who is named as licensee in 1866. The following year the Rolle Estates are offering him Pinn Farm (190½ acres) providing he gives up the Kings Arms, which he takes. In the November the Estate receives 11 applicants for the inn, which include John Gosling, blacksmith, John Baker, carpenter, Edward Hayman, all of Otterton. James Quick & James Parsons of Exmouth, William Brice of Dawlish, William Cain of Exeter, James Best of Knowle, Thomas Pile, William Chowings of Topsham. Eventually William Wheaton, publican and wheelwright, of The Ship (now No 2) The Strand Topsham was given a 21 year lease from ladyday 1868 at £10 per annum providing he spent £150 on repairs completed within a year.. By February 1870 these had only half been completed and Wheaton was bankrupt. He had approached Richard Searle, Sidmouth Brewer, who presumably supplied his liquor, for a loan but as Searle demanded the lease from Wheaton as surety, The Estate would not agree, Somehow he managed to raise the money from other sources and eventually spent £200 on repairs. The state of the inn at this time was described as “very discreditable” by Robert Lipscombe, the Estate Land Agent. 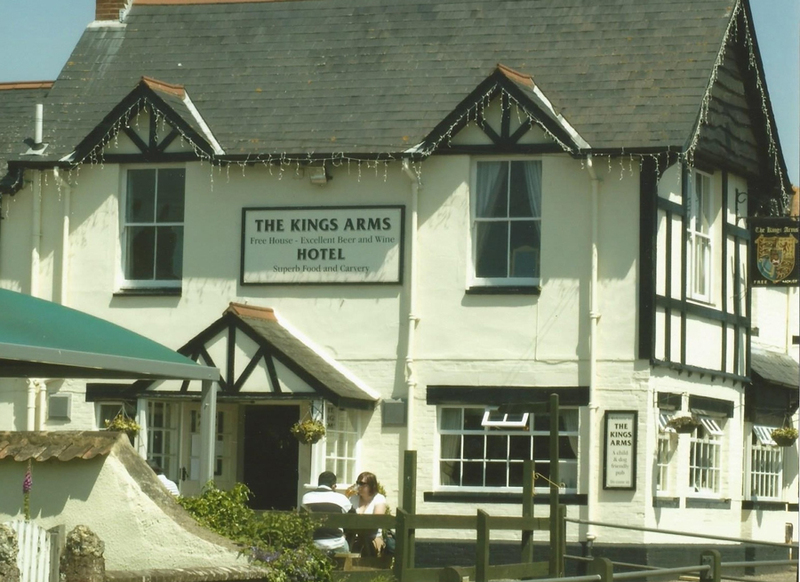 At this time the inns of East Budleigh were authorised to remain open until 11pm, whereas the Kings Arms had to close at 10pm. This rule incensed Mr. Wheaton and he tried to get round this by applying to the Magistrates for an extension on Rolle Rent Dinner Days. On 6th.June annually tenants assembled at the Kings Arms to pay their Rents and were treated to a Dinner. Most tenants had left by 8pm, about half dozen remaining. Mr.Lipscombe could see no reason for an extension and persuaded the Magistrates to turn it down. In May 1884 a scene occurred at the Kings Arms which “distressed Mr.Sweet (The Vicar) beyond measure and he preached about it and the sin of tempting a neighbour to make a beast of himself” Bets had been laid as to who could drink the most – leading to quarrelling and blows. As this appeared an isolated incident , Mr.Rolle took no action, but threatened to take the Rent Dinner elsewhere if there were similar occurances. By 1888 Wheatons lease ran out and the Kings Arms had got into a filthy, dilapidated state, with a filthy stable yard. There had been complaints from gentlemen fishermen who held Otter tickets and baited up in the yard. The Rolle Estate had hoped to evict William Wheaton, the licensee, and reopen as a Temperance Inn. However after negotiations with George Vallance, the Sidmouth Brewer (later absorbed into Devenish Brewery) was offered the lease providing they spent £500 towards rebuilding the inn. They could either build a new house and receive a 99 years lease at £5 pa, or if the shell of the old house was retained, a 60 year lease at £7.10/-. They opted for a new building designed by Kirby & Ellis and built by Rogers & Co. both of Exmouth. The original plans showed an entrance on the east side, turned down by the Estate as the brook would need rebridgeing. The eastern area was to be turned into a private garden on the site of the ground level cellar stood. 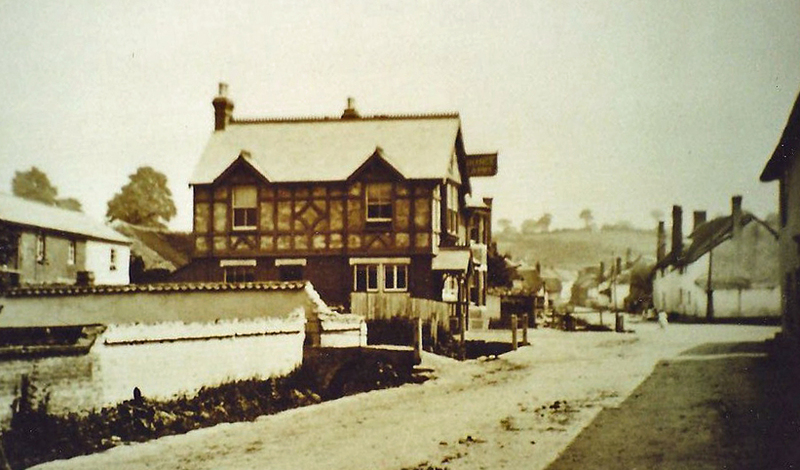 The building work took place between January & October 1889 and Mr.Lipscombe comments that he is “sorry not to see the old fashioned “Kings Arms” sign put up again. These kinds of signs are becoming things of the past and as the style of the building also savours of the past, I think the old sign would be much in keeping with the new building” He remarks very favourably on its appearance and is “afraid that for the present, Wheatons rough ways and his children (he had 17, 8 of whom lived in) would not render the house a very attractive venue for anglers”,”he keeps a house which no gentleman, let alone a lady would come to go in”.Mr. Wheaton was kept on as Vallance’s landlord and died on 5th. December 1903. On Wheatons death, William Alfred Coate became the licensee. He was 22 at the time. His father was a traveller for Vallances. 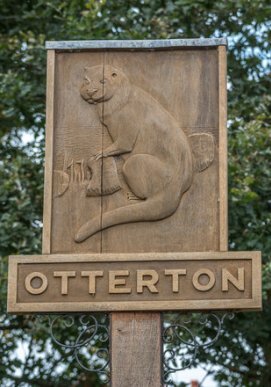 Bill Coate set about creating the “Otterton and Bicton Football Team”, known thereafter as the Otterton Rollers. In 1923 they won the coveted Morrison-Bell Cup. Bill Coate was keen on horses and horse racing and probably had other means. In the early 20th.century the Kings Arms had a thriving business, especially on market days. Meals were provided to farmers etc. on the first floor. Bill had died in 1949 and Ethel his wife continued as licensee until her death in 1963 followed by her daughter and husband Bill & Eileen Fletcher. Later licensees were Mr. James, Mr. Yates, Frank Holwill (1965) then his daughter and husband, Julia and David Seager. The Vallance lease expired in 1988 and a new lease was eventually granted to F.W.S. Carters company Tripletotal Ltd., in 1990 who completely rebuilt and refurbished the interior. John and Katie Collingwood took over as managers. Harry Blundred’s company Transit Hotels Ltd. had taken over the lease by the mid 1990’s and in early 1997 built a single storey restaurant attached to the east side of the inn. In September the village Post Office and shop closed and the Kings Arms took over the license, converting the restaurant into a new Post Office and shop named “Arkwrights”. After 140 years the Post Office had returned to the Kings Arms. At the same time the restaurant, now called “The Kings Table” was reopened in the old stables, which had been used as a bowling alley and recreational area previously. In 2000 rebuilding the first floor took place, increasing the number of bedrooms. By 2004, through ill-health John Collingwood had to retire, to be replaced by Zoe and David Ellison, to be followed the following year by Ian Simpson. On 28th.July 2006 the Post Office and shop (Arkwrights) was closed and the building reconverted to a small hotel/restaurant. Michael Hext, Manager by 2008. 2014 interior refurbished, Michael Dabrowiecka, Manager. In 1990 I was consulted by John Collingwood as to the Kings Arms sign and advised the arms of George III as the name had changed during M.G.Palmer’s time and is first named about 1800. The sign was eventually removed in 2013, whereabouts not known. 2013 King George III sign to right. Fairlynch Museum, Budleigh Salterton have a polyphone on display, at one time used in the Kings Arms.